After her generous, and unintentional, donation for splinter-free park benches, Velma Harmon gets invited to a charity dinner hosted by the Beautification Committee of Bliss at the home of Everett Gaines, one of the wealthiest widowers in town. With no interest in going, she hopes to find adventure elsewhere, much to the dismay of Ethel and Chief Rayne. 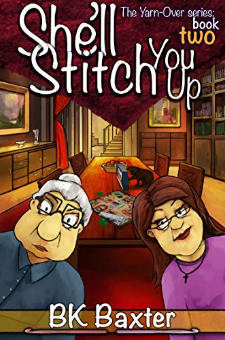 Ethel has always wanted to see Gaines Manor up close, and Chief Rayne just wants Velma to enjoy her retirement and stay out of trouble.When Ethel begs her to go to the event in hopes of finding herself a man, Velma reluctantly agrees. But when a heavy storm takes out a tree and a bridge, Velma finds herself trapped in Gaines Manor with two dead bodies, one handsome mailman, and a vicious killer. Who said nothing exciting ever happens in Bliss, Texas?